When all else fails you can always rely on whiting to keep the rod tips nodding. So here’s a load of top tips that are sure to get you bagging more fish this autumn. WINTER is the time of year again when the most common shore-caught fish will be the whiting. 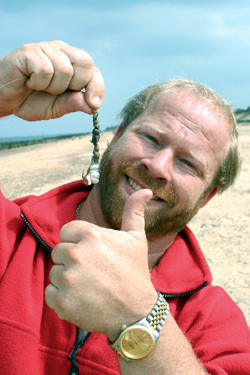 They show in vast numbers from most clean beaches and piers around the UK and can be caught on almost any bait. They will even venture just a few yards from the shore, which makes them accessible to anglers of all abilities. A calm, moonlit night is often the most productive time for these hard-hitting fish. This is because darkness brings them closer to the shore. In daylight hours they will still make an appearance but they tend to be in fewer numbers. Only extreme distance tactics will produce more of them when the sun is up. Whiting usually turn up around late August and will stay right through until early spring. Unfortunately, this is also the time when anglers are also preparing to target the much larger cod. But if it wasn’t for the whiting most of us would have hung our rods up years ago, as this is the fish that keeps us going through the harder times – when the cod are proving to be elusive. So don’t despair when the cod aren’t there as the whiting are sure to keep you active during those long and cold autumn nights. 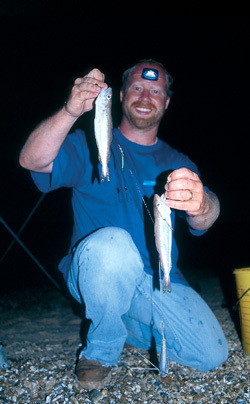 Here, Barney Wright shares his successful whiting tips. August to February is the time to expect whiting. The whiting is a member of the cod family and begins to show from August and can continue to be a main part of a catch through to February. The early fish tend to be slender and are often nicknamed ‘pin-whiting’ because of this appearance. They often weigh less than 10oz. But, as the weeks pass and we head deeper into autumn, so the fish begin to pile on the weight and these once small fish soon turn into bigger plate-sized fish that weigh around 1lb or so. Bigger fish will be present but they tend to turn up around October time and fish of 2lb aren’t uncommon. To identify a whiting, it is necessary to know that there are three fish that look similar in appearance – the whiting, pouting and poor cod. The easiest way to identify a whiting from the others is that it has not got a pronounced barbel under its bottom jaw, whereas the others have. Also, the pouting has a deeper body than the whiting and poor cod tend to leave a residue of slimy scales on the hands when handled. Whiting are not overly fussy about what they eat because when they are in large shoals it is a case of eat or be eaten. So almost anything that crosses its path is likely to be swallowed up by big mouths. There are a few baits that tend to be more successful than others for whiting, which include blow lug, black lug, ragworm, squid and fish. On their own, these baits do work well. But a cocktail, or mix, of any of these baits does seem to attract more fish to the hook. One of the favourites is usually worm bait tipped with a piece of fish or squid. A top tip is to lightly elasticate the fish onto the hook point and secure it in place. This is because sometimes fish baits can be a bit mushy and can fly off during the cast or be washed off by the tide. Bigger whiting are better targeted using fish baits alone because they are a predator and do feed on other fish. A strip of mackerel, herring or a whole sandeel secured to the hook with elastic is the best method for the better fish. The choice of hook is always dependent on the target species and the necessary baits required to go on the hook. Where whiting are concerned, although they are usually only small fish they have amazingly big mouths. With this in mind, choosing a hook size is not difficult because they can fit almost any size hook into their mouths. However, it is most recommended not to use too small a hook because whiting hit bait fast and hard, usually leading to the whole lot being engulfed. The main problem with a swallowed hook is that a lot of damage can be done to the fish while trying to remove the hook. So going along this line of thought, it is best to use a long-shanked pattern hook, anything between size 1/0 to a 4/0 to aid easy disgorging. Another good reason for using larger hooks is so that plenty of bait can be loaded up to help increase a scent trail for the whiting to follow. 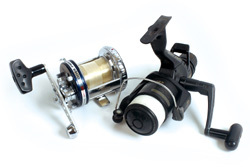 Whiting fishing, as a rule, is done with the standard beach fishing set-up consisting of a 12ft to 13ft beachcaster, multiplier or fixed spool reel and heavy leads. This is fine but does tend to lead to a bit of an unfair advantage for the angler. The little whiting don’t stand any chance at all, which is a shame because in their own right they are good little scrappers. So, with this idea in mind, the way to get the very best out of whiting fishing is to go light, especially when the whiting are close in. Try and use a bass rod, estuary-type rod or a light match rod for sensitivity, combined with a small multiplier or fixed spool reel loaded with light line or braid. This combination will make every fish caught feel like a good-sized fish and it is more likely to give a bit of a fight, so it feels as though you are actually doing something other than simply reeling in. These light outfits have become increasingly popular over the years but often only for summer fishing. We would recommend that you still carry the outfit in winter and while you are waiting for a cod to show with your standard tackle you can still have some fun with the whiting. A fact about whiting is that they have a row of needle-sharp teeth and if you have ever caught them you’ll be familiar with sore fingers, which are caused by the teeth when unhooking the fish. Many anglers make the mistake of switching to lighter snoods, simply because the fish are small. But because of the sharp teeth of the whiting they can easily chaff and cut through the lighter hook snoods. One way to overcome this dilemma is by regularly changing the snoods after a few fish and replacing with fresh snood line. Run your fingers along the snood just above the hook to feel for any rough areas that will undoubtedly have cuts from the fish’s teeth. But this can prove to be a bit of a nuisance and could become frustrating after a while. 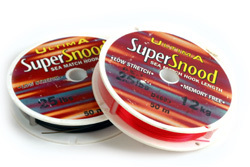 Another way to deal with the problem is to use heavier snood line, something around 25lb to 30lb breaking strain. Don’t worry about this scaring fish away from the bait, as whiting aren’t hard fish to catch and will not be put off by clearly visible lines. 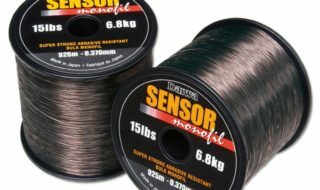 If you are in doubt, try using a fluorocarbon line. A thicker line is far more abrasion-resistant than a thinner one, so checking out the line’s diameter is an important issue to consider. It is also worth noting that it is generally the cheaper lines that tend to have the thicker diameters, so costs are kept low, too. Don’t make the mistake of using light snoods – whiting may be small but their teeth are razor sharp. But use a small multiplier or fixed spool reel with a lighter mainline or braid and a bass rod to make it sporting! Whiting are shoal fish and when one turns up, it is usually followed by a lot more. They swim around the sea bed at fast speeds picking up anything that is food related, so it is important to make sure that your baited hooks are out there when this happens. When a whiting takes the bait, it is a very sharp and abrupt rattle on the rod tip, sometimes when fishing at close range can almost be savage! The bites really are very distinctive and nine times out of 10 you can be sure that it is a whiting because of the aggressive nature of the take. However, don’t be so quick to jump on your rod, especially if you are fishing more than one hook, as it is a certainty that there will be other fish to come along and fill up your trace. so allow the bites to develop for a while because you never know quite what is out there and what could end up on your hook. 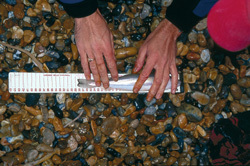 For most of the autumn and winter the whiting will be found quite close in. In fact, they can be right under your feet at times and any kind of rig will do. 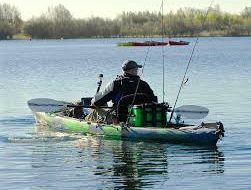 However, there are venues and occasions when you will only find the fish at range and this will require a different tactic altogether. When they are close the most successful rig of choice would be the three-hook flapper without a doubt. It’s an easy rig to construct and it allows you to try different baits on different hooks. It also provides an opportunity for you to catch three fish at once. Experienced anglers will be able to cast this rig a long way, but the novice may find that it drastically reduces their casting distance – or the bait simply flies off the hook due to a poorly-executed cast. The solution to this problem is simple, but requires a little more time constructing the rig. Try adding some small bait clips like the Breakaway Cascade swivels or even the new Gemini booms which incorporate bait clips. This will streamline the trace for a better flight and result in a longer cast. 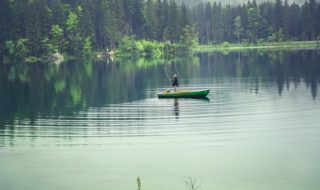 If the fish are further out still, then you will have to change tactics totally and revert to a single-hook snood that is clipped down tight behind the lead. You should also avoid putting too much bait on the hooks as this will reduce distance dramatically. When the whiting are showing in large numbers, or the water has a little bit of colour to it, then fishing for them at anytime during the day or night will provide results. However, whiting are renowned for their nocturnal feeding habits and there are times when you won’t get a bite all day, but as soon as the sun fades all hell breaks loose. It’s almost as if someone has thrown a switch and released the whiting into the sea. Personally, I believe that these fish are feeding 24/7 but not close enough to the beach. Then, when darkness falls, the fish scurry to the shallower water in search of food that is being dislodged from the sea bed by the tide and crashing waves. It is also the time that the whiting feel safe to feed as they use the cover of darkness to avoid any predators that may be lurking in the feeding zones too, such as cod and bass. The best time to target whiting is when high water falls just after darkness. For example, if sundown is say 7pm the best tide to look for is one that peaks before midnight. The reason I say this is because whiting do tend to wait until darkness before they will venture really close inshore. Therefore the majority of fish are ready to feed as soon as darkness falls, often with really big appetites. If you wait until a later tide then the chances are that fish have already fed heavily. You will catch, but maybe not as many as you would with the tide times I’ve specified. There is a myth which has been around for many years now, that WD40 works exceptionally well as a fish attractant. Those who have already tried it may know where I am coming from here! Well, the truth is that it actually does work, especially where whiting are concerned. The reasons why and how it works are a little vague, but it is believed that the WD40 leaves a slick that is carried downtide. The fish pick up the scent and head towards it. Although WD40 is an oil dispersant, it still leaves a trail much like oil would and it looks very similar to the oil which is washed out from a piece of mackerel. 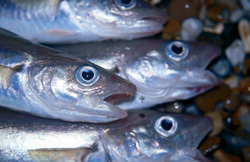 And we have already explained that whiting are very keen on oily fish, such as mackerel, herring or sprat. But, whatever the attractant is with WD40, it is still an effective way of attracting more fish to the hook or picking off the odd straggler when the fishing is hard. All you do is bait up in the usual way and then, before you cast out, spray a little WD40 on the offering and cast the bait out as normal. Another source of attraction to the fish is anything that glistens. With the use of attractor blades, sequins or beads you do increase the chances of a whiting finding the bait because of the fish’s predatory nature. Anything that stands out from the norm will get the attention of the inquisitive whiting, especially during daylight conditions. Be aware of the size limit – at the time of writing you should not take a fish under 27cm long. A very important thing to know about whiting is that the legal size limit, which is currently set at 27cm, and anything under this size must be returned. It is a well-known fact that if an undersized fish is returned, by simply throwing it back into the water, 99 per cent of them will not survive! The best way to return a fish is by gently removing the hook then walking to the water’s edge and placing the fish into the sea. Treat your whiting like you would any other species and do your bit for conservation. This way most of the returned fish will survive. Also, only keep what is necessary for the table and what might be put into the freezer for a later date. If you are fishing a match and you want to keep your fish alive for the weigh-in, then the best way to do this is to keep the fish in a large diameter bucket filled with fresh sea water. Adding an aerator to the bucket will also help keep fish losses to a minimum. The water in the bucket will also need replacing regularly, usually every 30 minutes but up to an hour if you use an aerator.